Tune: "Tell It to Jesus Alone"
Was by him-self. He was all a-lo-ne. Sa-tan came and tempt-ed him for three times. First time he used a hard stone. Are yo-u hung-ry? Make bread of this stone. Then the de-vil showed him all the king-doms. Oh, such a splen-dor Je-sus did se-e. If you'll on-ly wor-sh-ip me. Je-sus then ans-wered, "It i-s writ-ten"
He is the One we a-dore. To th-e high-est place in the tow-n.
An-gels won't let you fall down. Lord your God to the test." For a short while gave Him rest. 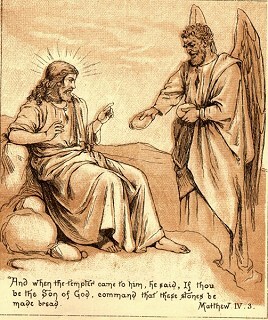 Print lyrics "Tell It to Jesus"
Hear the tune "Tell It to Jesus" Edmund S. Lorenz.